Home » Assistant Professor » Associate Professor » Maharashtra » Manipur » Professor » Pune » STATE GOVT. 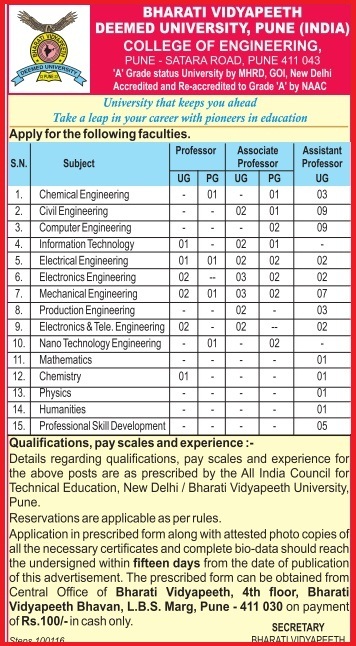 JOBS » Teaching » Teaching Posts in Bharati Vidyapeeth Deemed University, Pune (India). Last Date: 24.01.2016. Teaching Posts in Bharati Vidyapeeth Deemed University, Pune (India). Last Date: 24.01.2016. How to Apply: Prescribed Application form along with attested copies of all related certificates should reach to the concerned address.